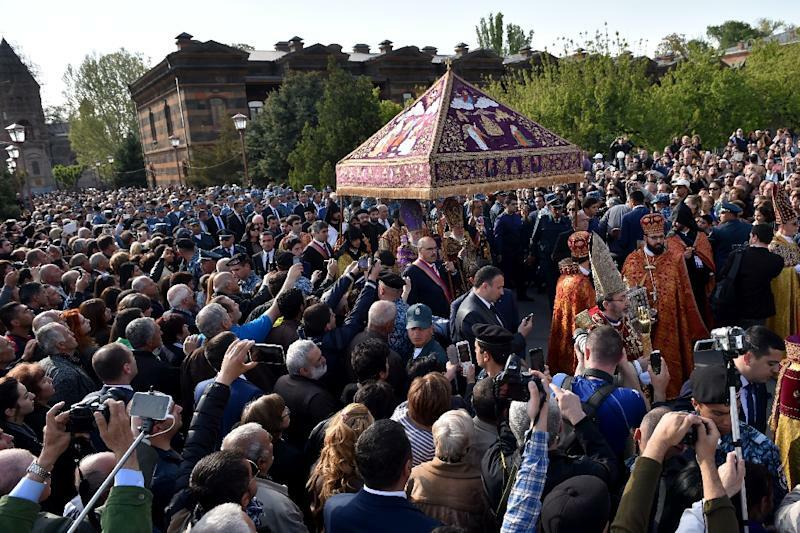 ECHMIADZIN (Armenia) (AFP) - The Armenian Church on Thursday conferred sainthood on some 1.5 million Armenians massacred by Ottoman forces a century ago, as tensions raged over Turkey's refusal to recognise the killings as genocide. 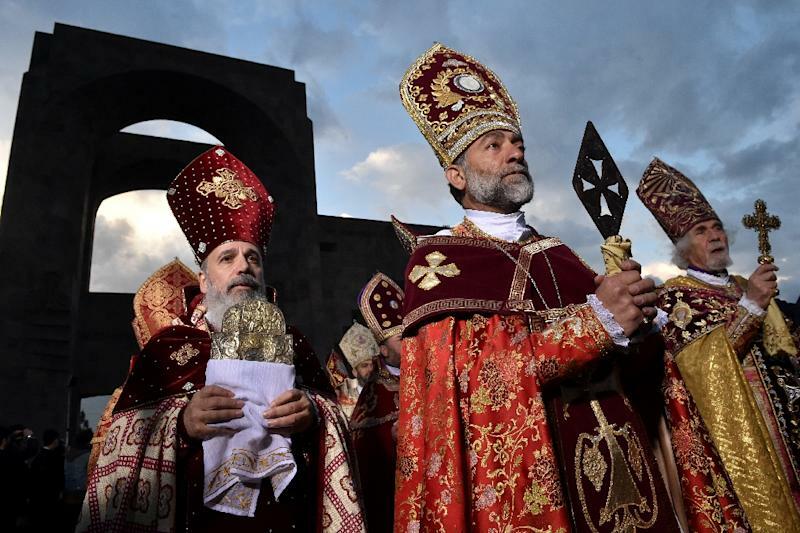 The two-hour ceremony outside Armenia's main cathedral, Echmiadzin, close to the capital Yerevan, ended at 7:15 pm local time, or 19:15 according to the 24-hour clock (1515 GMT), to symbolise the year when the massacres started during World War I. At the end of the ceremony attended by President Serzh Sarkisian, bells rang out across Armenia and a minute of silence was observed. "Souls of the victims of the genocide will finally find eternal repose today," said 68-year-old social worker Varduhi Shanakian. Ex-Soviet Armenia and the huge Armenian diaspora worldwide have battled for decades to get the World War I massacres at the hands of the Ottoman forces between 1915 and 1917 recognised as a targeted genocide. Ankara says 300,000 to 500,000 Armenians and at least as many Turks died in civil -- rather than religious -- strife when Armenians rose up against their Ottoman rulers and sided with invading Russian troops. In a rare interview with Turkish television broadcast Thursday, Armenia's Sarkisian expressed hope the two countries could mend fences. Russian President Vladimir Putin and his French counterpart Francois Hollande are expected to be among a handful of leaders to travel to Armenia for the commemorations, but others are shying away for fear of upsetting Ankara. In a move expected to draw an angry reaction from Turkey, German President Joahim Gauck on Thursday condemned the massacres as genocide, the first time Berlin has officially used the word to describe the bloodletting. Speaking at a religious service commemorating the centenary, Gauck said the then German empire -- the Ottoman Turkey's ally in WWI -- bore "shared responsibility, possibly shared guilt for the genocide." On Wednesday, Turkey recalled its ambassador to Vienna in protest at the Austrian parliament's decision to call the massacre a "genocide." Earlier this month Ankara also recalled its envoy to the Vatican after Pope Francis described the killings as "the first genocide of the 20th century." More than 20 nations -- including France and Russia -- have so far recognised the Armenian genocide, a definition supported by numerous historians. Turkey will on Friday host world leaders to mark the 100th anniversary of the start of the Battle of Gallipoli, a day earlier than the actual start of fighting. 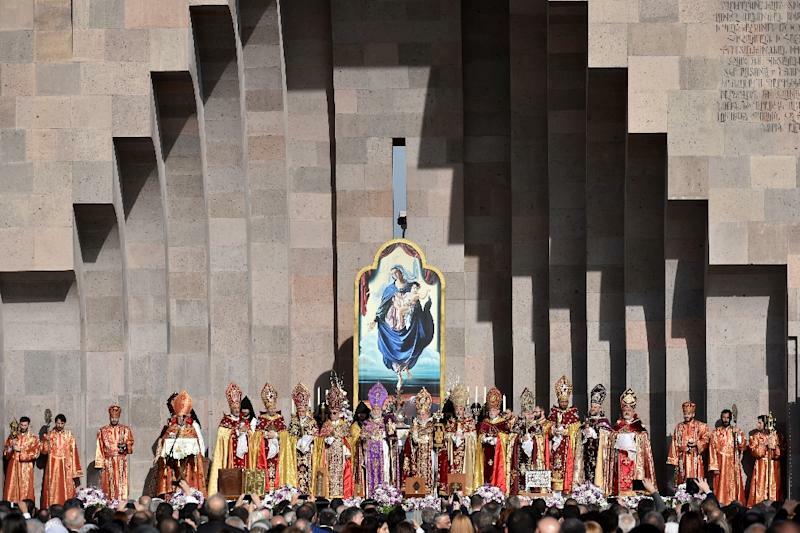 Sarkisian has accused Ankara of deliberately "trying to divert world attention" from the Yerevan commemorations.